“Orderly debt restructuring has been done hundreds of times, hundreds, like with Germany in 1953”. As the leader of Podemos has rightly pointed out on many occasions, sovereign debt restructuring is nothing new. Why, we may ask, should post-war Germany be helped to meet its financial commitments and rebuild its shattered economies, but Greece and other southern European states should not? Well, the standard narrative on the right is that after an initial helping hand, German productivity and fiscal acumen allowed it to become a regional manufacturing powerhouse. After West Germany had sufficiently re-established itself as a responsible and affluent member of the international community, it was then helped to reunite with its crumbling, post-communist sibling. The beauty of this simplistic version of events is that it is essentially a story of redemption and triumph over adversity, and so lends moral weight to Germany’s central role in contemporary European affairs. It does not, however, hold up to scrutiny of the facts. It was Germany’s central position in the cold war, as well as its divisive position in post-war Europe that made the USA aggressively promote it as a new capitalist powerhouse on the continent. By promoting the European Coal and Steel Community (the precursor to the modern EU) with German participation, the USA embarked on a project to strengthen the Deutschmark as an additional pillar of capitalist strength, and work towards the creation of a vast trading block. Nowhere is the commitment to rebuilding the German economy clearer than in the details of the 1953 debt restructuring, where debt repayment was tied to export revenue. Creditor nations therefore had a vested interest in buying German exports, thus allowing the indebted nation to repay its debts and become ultra-competitive on the global scene. But in the 62 years that have passed since, the rules of the game have changed beyond recognition. The European project has boomed into a vast bureaucracy overseeing a continental marketplace. With the advent of the single currency at the beginning of the century, the Eurozone members committed themselves to the observance of strict financial rules in exchange for the so-called stability of a single unit of currency designed to reduce transaction costs and promote financial security within the bloc. It is now widely known that countries, including Greece, failed miserably to meet the requirements of euro entry but were admitted anyway through a combination of financial fraud and European bonhomie. Although this may look like a tragic mistake in hindsight, it was crucial to the project that the southern European countries join the single currency in an irreversible manner. As soon as Greece, Italy and Spain were locked into a currency position which did not allow for default, they had sacrificed their only effective means of making their economies more competitive in the face of German exports (which, as I previously discussed here, are made so competitive by breaking Eurozone rules). In short, they were therefore doomed to run current account deficits vis-à-vis Germany ad infinitum. But to make matters even worse, the lack of mechanism for fiscal transfer within the Eurozone (with the original rules explicitly removing this possibility) meant that there has never been any way for the German surplus to be recycled within the union in the interest of stability and balanced growth. The single currency has been deeply flawed from the start. So this brings us to the present day. Germany cannot allow Greece its debt ‘haircut’ as this sets a precedent within the union which would then spread to other indebted countries and undermine the German position. A default, likewise, would be unthinkable due to the political forces it would unleash. But clearly it is also unthinkable for the Germans to allow debt restructuring along the lines of the German post-war deal, or even the growth-linked bonds suggested by Yanis Varoufakis, as this would set a precedent that would erode Germany’s competitive position vis-a-vis it Eurozone ‘partners’. As Pablo Iglesias is more than aware when he evokes the 1953 German debt deal, we live in a different era and under different rules. Without the shadow of the Soviet Union looming over Europe, it is clearer than ever that European integration has always been much more about capitalism and business than it has about politics or people. And nowhere is this clearer than in the Greek bailout extension agreed this week. Once the German parliament approves the deal later today, Greece will be eligible to receive the remaining 7.2 billion euros of bailout funds. 2 billion of this will go on interest payments on existing debt, 1.6 billion must be paid to the IMF in March (likely before the cash even reaches Athens) and 7.5 billion will be demanded by ECB in July once bonds mature. So the bailout is not even enough to guarantee Greece’s short-term debt obligations. Although, the solvency and liquidity crises seem to have been staved off in the short term, the chances are that none of the additional cash can be diverted to fighting the ongoing humanitarian crisis. The final indignity will arrive four months from now when Greece will have to return to its creditors in an even weaker position than it has been over the last month of negotiations. But with this in mind, it begs the question as to why Syriza did not threaten to use its nuclear negotiating option of debt default and euro exit? Reading through Yanis Varoufakis’ blog reveals that even back in 2012 he felt that Greece would never be able to survive a default outside the Eurozone so suggested then that the best tactic in negotiations would be to threaten a default within the union. That this has never been mentioned publicly since Syriza took office suggests that this was dismissed out of hand by the creditors. But worryingly, this suggests that in entering negotiations, Varoufakis and Syriza felt that it was Greek euro membership that was inviolable, rather than the suffocating austerity conditions that they were elected to reject. Syriza does not have a mandate to leave the Eurozone but neither does it have a mandate to go back on its anti-austerity platform in order to stay within the currency union. All Syriza has done at this stage is prolong the financial agony and satisfy the demands of the Troika and the Eurogroup for an extra few months. As the end of the four month extension nears, Syriza will not only be in a weaker negotiating position due to its acceptance of the current bailout extension, but will be in a weaker political position within Greece as voters realise that the change they voted for has not transpired. It is hard to see the current situation as anything other than a defeat for the Greek government and a serious blow for the democratic rights of individual nations. A defeat for Syriza could also mark a serious blow for the left across Europe, and Pablo Iglesias in Spain will now be looking nervously over his shoulder at the rise of the Ciudadanos (‘Citizens’) party. With all eyes on the Greek struggles, and much apathy with the ruling establishment, Ciudadanos offers to fight unemployment, inequality and poverty but to do so in way that does not rip up the political rulebook in the way demanded by Podemos. They seek reform rather than revolution and, interestingly, they do so on a pro-EU platform. This message has begun to chime with voters, with the Citizens already polling at over 12% and rising. That support from this movement could be indicative of a backlash against the left is shown by the use of some of some high-profile right-wing personalities in the Ciudadanos campaign posters. Syriza’s actions in Greece are sending the message that there is no radical alternative to neoliberal capitalism in Europe, enforced by the Troika and the member states. Voters are being conditioned to look only within the current system for change. This is a blow for the left and one which has opened the door to more conservative or right-wing movements designed to appeal to the young and unemployed but with sound connections to the ruling elite. Podemos have much to fear from the emergence of Cuidadnos in Spain but the more immediate danger is surely in Greece. If the left continues to lose credibility, the public may move to the right in search of alternative solutions, which may well open the door to the fascist uprising that Varoufakis has often mentioned. 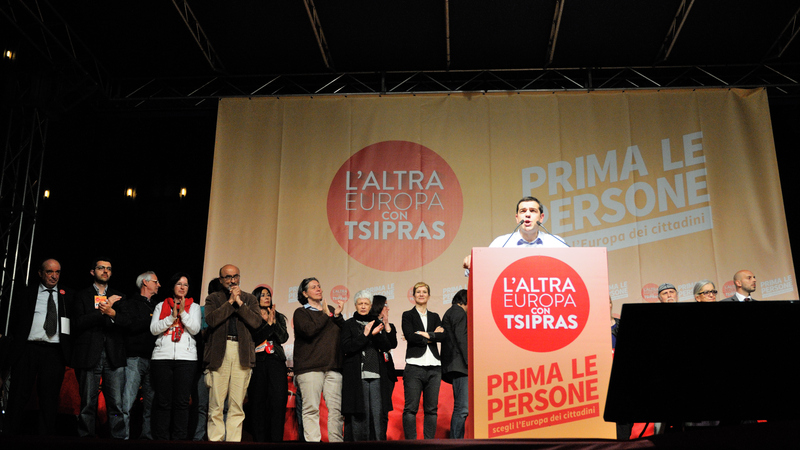 European politics is at a crossroads, and the platform of the new, popular left has been weakened by Syriza’s defeat at the hands of the Greek creditors. Syriza’s fear of going it alone could ultimately be its undoing. There is still time to reassess this stance, and take a firmer stand for the next round of bailout discussions but this would require a paradigm shift in thinking from some of the party’s less radical members. But they need to ensure they do not lose the trust of the Greek people because if that is lost, then support for leftwing solutions to Europe’s malaise could quickly disappear with it. And if that happens, the chances of Podemos being able to bring its manifesto to the international stage may be lost too.